Transport your supplies easily with this rolling unit. Constructed of solid maple and maple veneer. The right side of the unit is fitted with 1/4" pegboard and hooks for tool mounting. 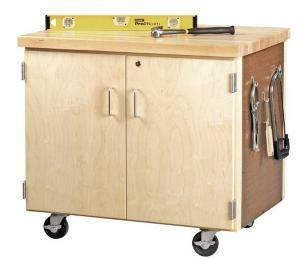 Unit also includes locking double doors, an adjustable shelf and 4" locking swivel casters.